Wanting to take advantage of a free day in my schedule (it was Memorial Day, after all! 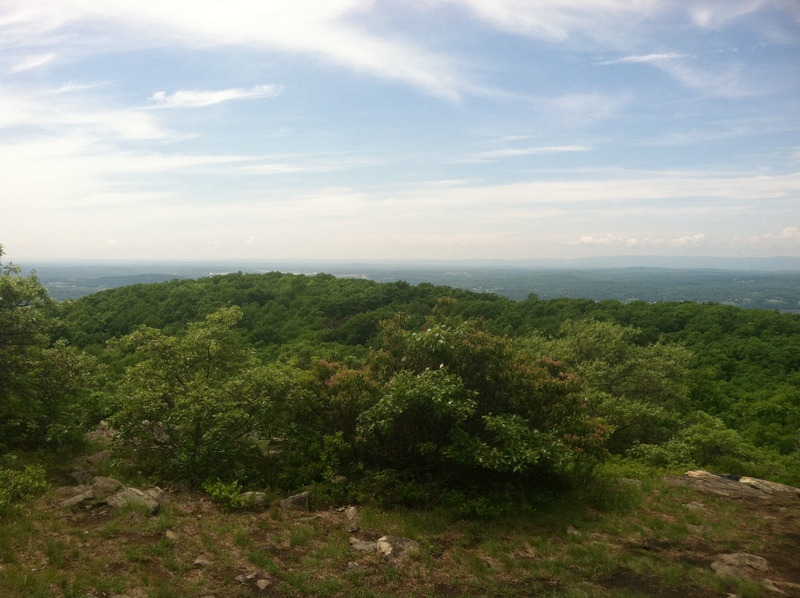 ), I decided to take on the summit of Scofield Ridge, which at 1540′ above sea level, is Putnam County’s highest point. 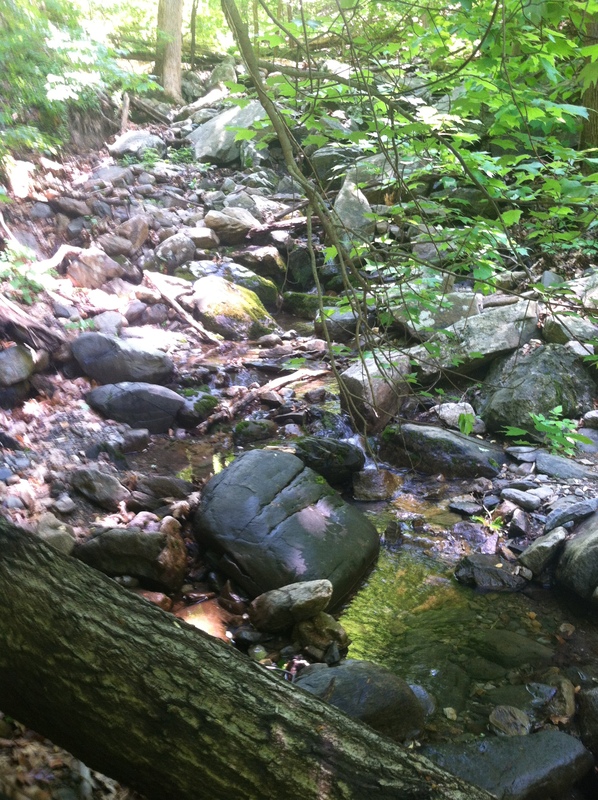 It lies on the eastern edge of the Beacon mountains, a small mountain range in the Hudson Highlands that also contains the locally-famous Breakneck Ridge, a hike which draws legions of outdoorsy folks from New York City almost every weekend. After a check of the map, I decided to avoid the heavily-trafficked Mount Beacon trail head, and instead drove over to nearby Glenham, from where I could approach the mountain “far from the madding crowds”, as it were. I set out from the red-blazed Overlook Trail, which began fairly quietly in terms of its degree of challenge, but within a few hundred meters, became steep and quite rugged. I passed a sign at a trail junction that pointed to a place called Malouf’s Campground, beyond which the trail became notably more challenging. After crossing a small stream and curling downward around the mountain a bit, I climbed further and came upon first, one pair of scenic viewpoints, and then another about a 1/4-mile later, at the terminus of the Overlook Trail. 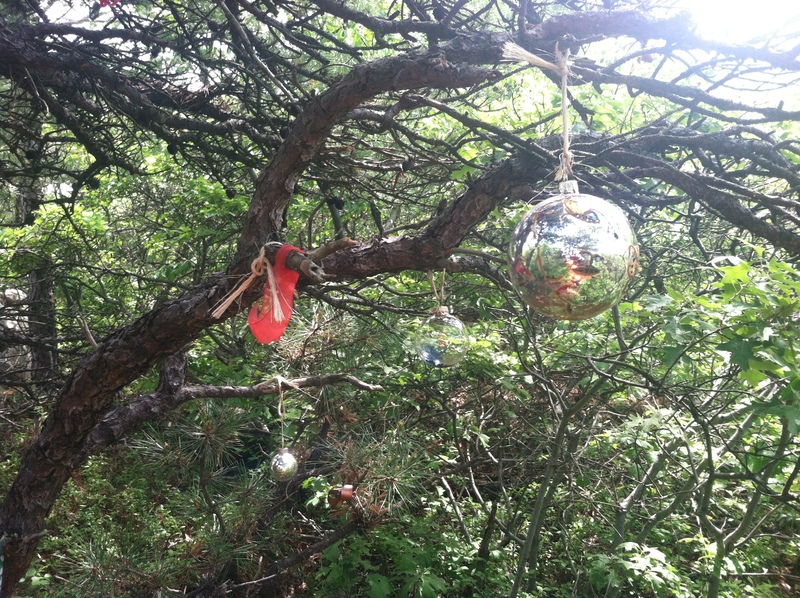 In an obviously off-season tribute to Christmas, I found one of the fir trees here adorned with a variety of holiday ornaments and other decorations. 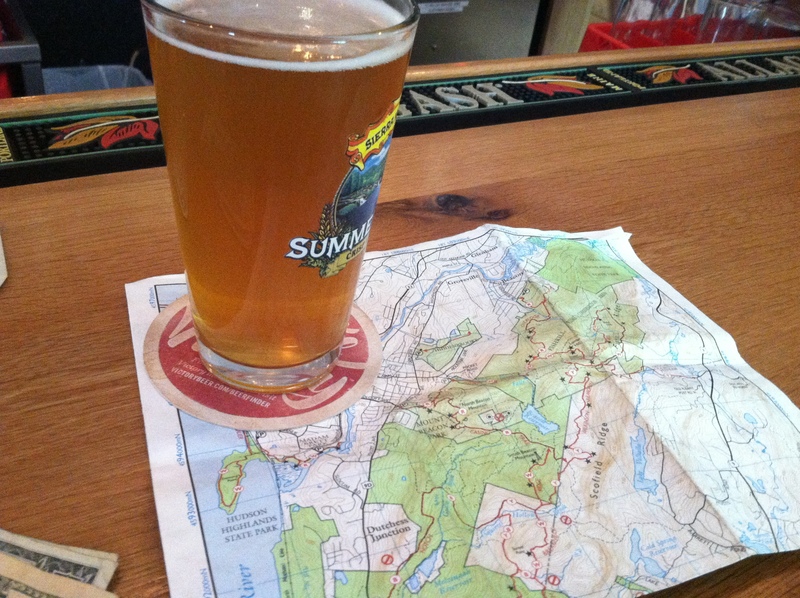 It made me smile…..
From here I turned left, now following the white-blazed Fishkill Ridge Trail. The trail took me down into a hollow at first, and then up and over the top of Lambs Hill. 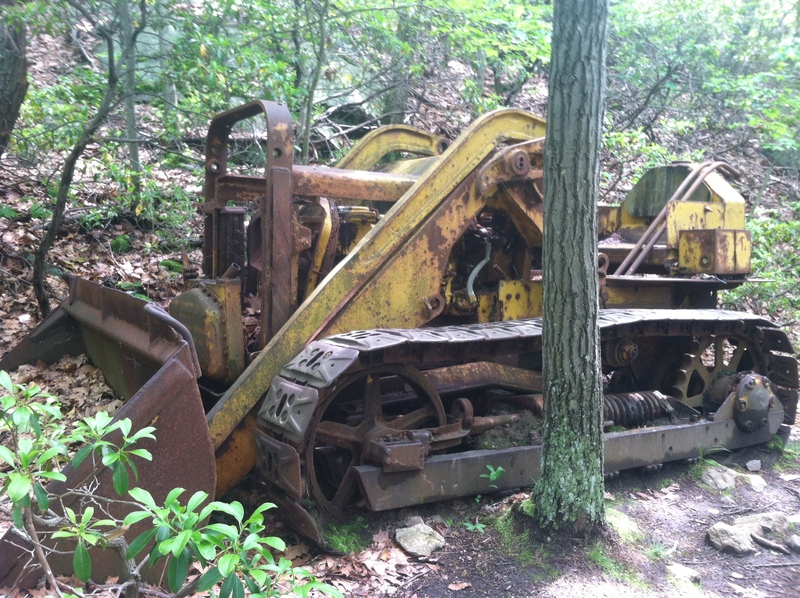 After descending the back side of Lambs Hill, I reached my next scheduled turn, onto a blue-blazed connector trail, whereat I came across my second anomaly of the afternoon, a full-sized bulldozer! I noted later on my Trail Conference map that this intersection is aptly called “Dozer Junction”. How long ago this piece of machinery was abandoned here I do not know, but it was an interesting highlight of the day. After completing the blue trail in sh ort stead (which was an incredibly washed out woods road), I turned right onto the Wilkinson Memorial Trail, which carries yellow blazes, and at nearly 10 miles in length, is the longest trail in the Hudson Highlands State Park trail system. 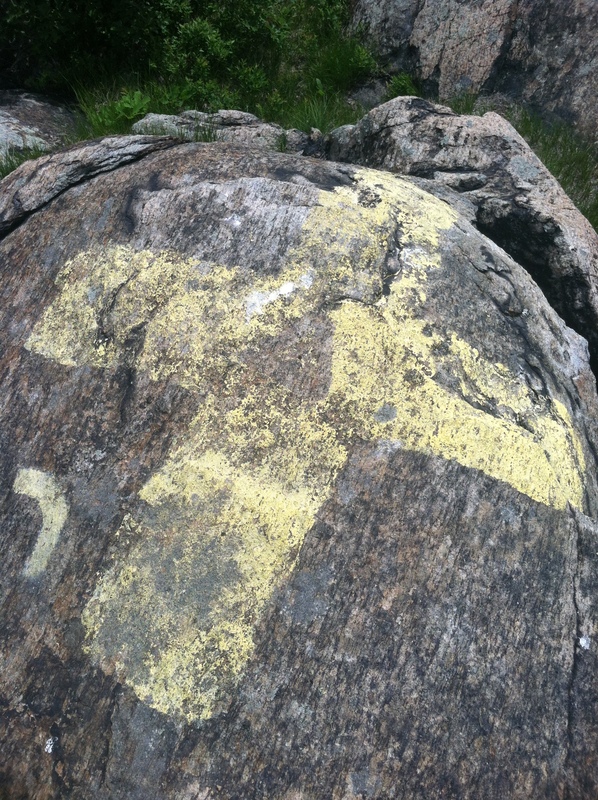 From here it was yellow markers all the way to the Scofield Ridge high point. Along the way, there were a couple of points that offered a nice vista of Clarence Fahnestock State Park to the southeast. As I skulked about in the summit area, celebrating and catching my breath, I heard voices, so suspected I would soon be seeing some other hikers. As the minutes passed, no one showed up, but the voices persisted. It was only when I looked west across the valley that I saw the Mt. Beacon fire tower, and realized that it was people up in the tower – hundreds of meters away – who I had been (and still was) hearing. Voices carry! A check of my watch indicated that I had underestimated this hike, and it had actually taken me almost twice as long to ascend as I had predicted. Accordingly, I wanted to choose the quickest route back to the car, and by my estimate, that was by way of the Casino Trail that goes up and down Mt. Beacon. After reaching the trail junction, I turned right onto the now red-blazed trail and started to pick up the pace. Once I had passed the turnoff for the fire tower, I began to run, and pretty much ran the whole way down the mountain. Day hikers were everywhere; a few going up, but at 4:30pm, most were on their way back down. At one point, a hiker said “show off!” as I passed her group. I just giggled, as I know non-runners will never understand why we run mountains. 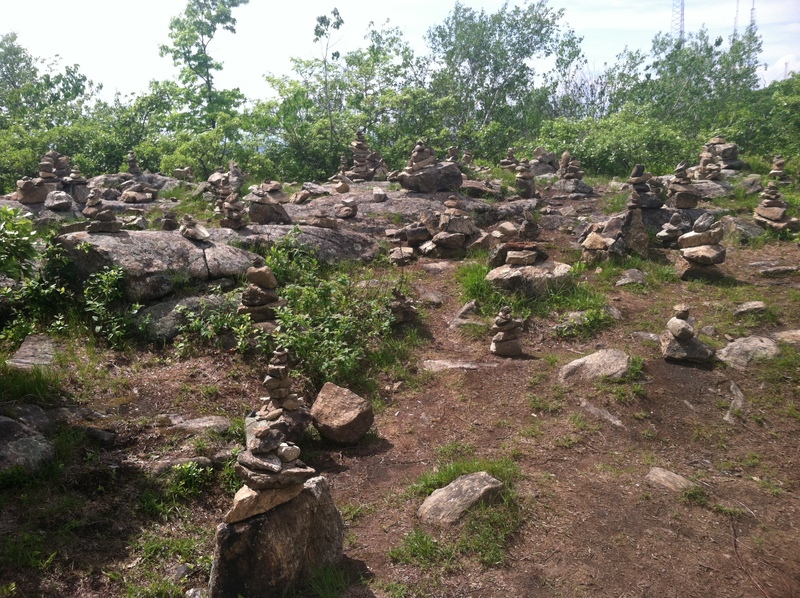 I stopped on the descent only once, to take a picture of a large collection of cairns near the radio towers. I presume that this formation of rocks has been created over a number of years by local hikers, and I made a brief contribution to the top of one of the structures before moving on. Ultimately, I reached the main trail head parking lot on Howland Avenue, and from here, had two miles to go to get back to the car. It was hot, and I was a bit worn out, so I traversed the road from Beacon back to Glenham in alternating walk-run fashion. With the last part of Sunnyside Rd being about a 200′ vertical climb, I was happy to see the car again. Scofield Ridge is now the 8th New York county high point I have checked off. All in all, a good day on the trails.